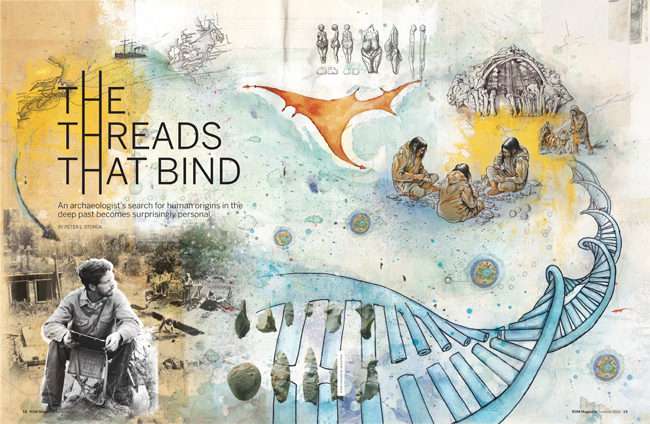 Art director Tara Winterhalt chose Janice Kun to create a double page spread illustration for the article Threads That Bind which first appeared in ROM, the magazine of the Royal Ontario Museum, Summer 2012 issue. The story is a true account of an archaeologist's search for human origins which became deeply personal. Janice's pictographic method of weaving the elements of the story together is reminiscent of it's ancient references.